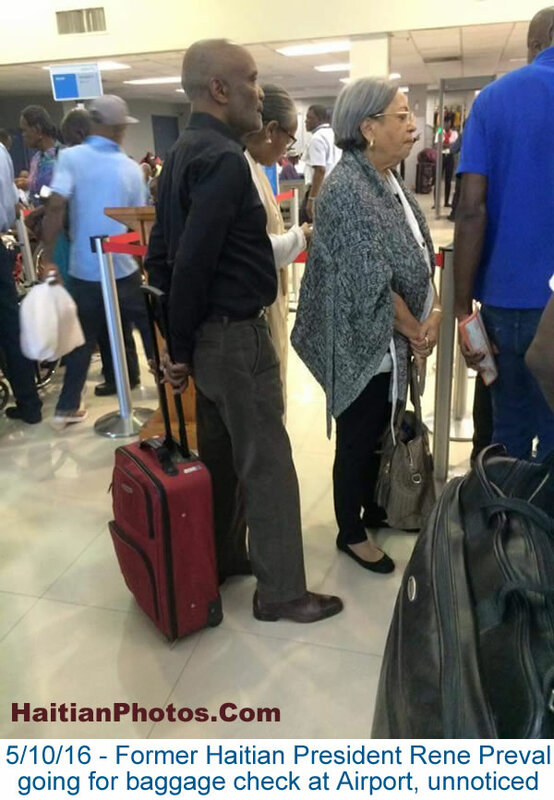 Here is a picture of Former Haitian president Rene Preval going for baggage check at Airport unnoticed. René García Préval (born Jan. 17, 1943) served two terms as the President of Haiti from February 7, 1996 to February 7, 2001, and from May 14, 2006 to May 14, 2011 and he is the first former Prime Minister to be elected President. He is the son of an agronomist, left Haiti in 1963 for Belgium to study agronomy. After earning a degree, from the Gembloux Agricultural University, he continued his education at the University of Pisa, to work in geothermal sciences. In 1970, when Préval moved to Brooklyn; there he served as a messenger and a waiter. In 1988 after returning to Haiti, he opened a bakery in Port-au-Prince that provided bread to poor children. It was there he met Jean-Bertrand Aristide, who was then a Roman Catholic priest working in the slums. In 1990, when Aristide was elected president, Préval became his Prime Minister (February 1991 to October 11, 1991). Préval was the first elected head of state in Haitian history to peacefully receive power from a predecessor in office and the first President in Haitian history since independence to serve full terms in office. Recently, on 10th May, 2016, Rene Préval was seen standing in the queue at the airport baggage check-in counter, like a common man going for a trip, unnoticed. There was no security, no one to carry his luggage, neither there was any diplomatic room for him. Many consider that he was the only Haitian President who could feel the pulse of Haitian people. He is the same president guy who never hesitated to leave the National Palace behind a motorcycle, because the traffic was congested.